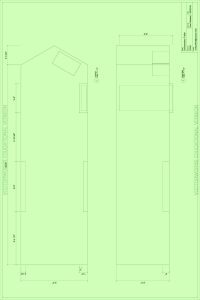 The Collaboratory is a retrofitted trailer with dimensions of approximately 24Lx8Wx7H. It is outfitted with electrical wiring. Projects using the space must be in accordance with responsible use policies (to be provided upon successful application). Possible uses of The Collaboratory include, but are in no way limited to, site-specific performance or installation, gallery-style project display, film screening, and all manner of creative workshops. The trailer has two entrances, one being a large back door that comes down to open up the space. Many different projects have used the space from thesis projects, to visiting artist residencies, students organization events, theater pieces, film screenings, art installations, and one solar-powered concert. Since March 2017 the Collaboratory has its very own power source- solar panels. Take a look below at the breadth of creative projects and events hosted in this unique space. Have a project in mind? Apply to the Collaboratory today! So far this semester the Collaboratory has been used for a wildlife photo exhibit as part of All Families weekend (for the second year in a row) as well as for Character Day on September 26th. Propose an idea and add your project to the impressive list of Collaboratory events! 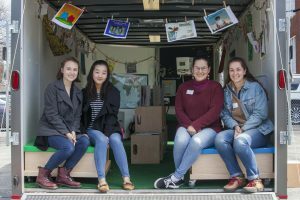 For the duration of the spring semester the Collaboratory was used by a new class to bring the exhibit, “Hello, Dear Enemy” to local schools. With a class of over 30 students, the trailer was re-imagined several times to best serve the lesson plans for each school group. 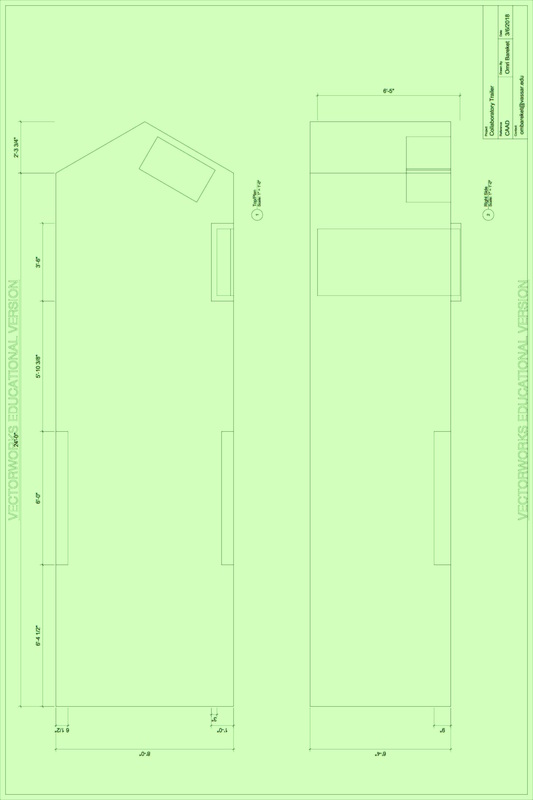 It is the plan to use the Collaboratory again for part of the Spring 2019 semester for the second iteration of the course. The Collaboratory was brought out to the farm, where it house an exhibit featuring native wildlife photos taken at Vassar’s campus. The photos were taken by Stephen Kovari ’19 and India Futterman ’19. The display aimed to educate and inspire people to show more interest in the natural world, and promoted the VCNature initiative. VCNature is an interactive outreach campaign that aims to get people to pay more attention to nature. Parked outside of Ferry House, the Collaboratory was home to an interactive sculptural exhibit. The residency was scheduled during the week before Halloween in order to act as an artistic haunted house for the campus. Students who visited the trailer built three dimensional elements inspired by dreams that they’ve had, incorporating their art into overall design. The project was inspired by George RR Martin’s MEOW WOLF installation in Santa Fe, New Mexico. MEOW WOLF is fantastical adult fun-house created by a collaboration of artists. The last day of classes for the 2016-2017 academic year was celebrated by a solar-powered concert and arts showcase. 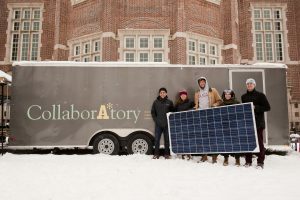 The Collaboratory was parked in the lawn next to Crafted Kup and served as an exhibition space for artwork as well as a power source for the concert using its solar panels. 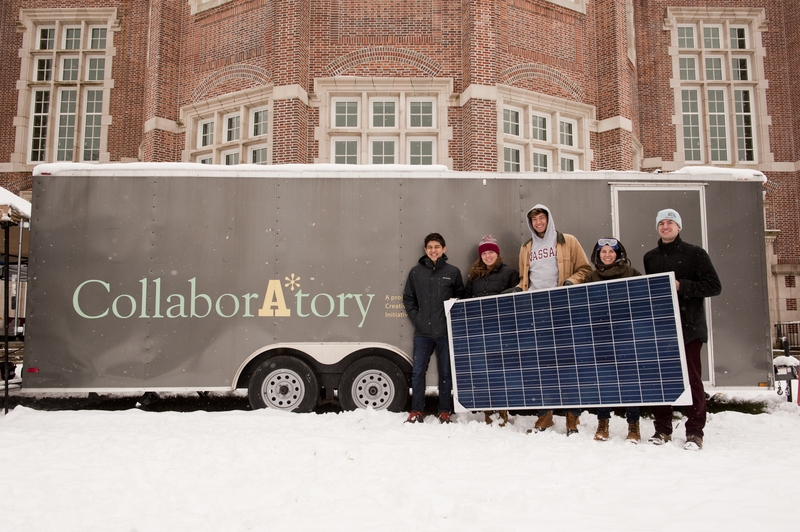 Performances included DJ sets from students and three student bands: fouronefour, Spud Cannon, and Townsperson B. VC Sustainability was also present in the Collaboratory to discuss the solar panel installation and its positive impact on Vassar’s campus and on Earth. As a precursor to her summer residency, Courtney Starrett came to campus to share her work in progress, Layer Chiffon, a hands-on interactive installation, inviting viewers to explore a sampled history of food, materials, and, gender roles in mid-20th Century America. The work was featured in the Collaboratory and purposefully scheduled to run in tandem with the Food Symposium based on its focus and theme. The Vassar Red Sand Project was an interactive art project meant to raise awareness for human trafficking. From the organizing students: “By syphoning red sand into sidewalk cracks across campus, we’re encouraging students to question their surroundings. The red sand symbolizes the victims who fall through the cracks of society- thus educating on the nature of human trafficking while engaging with the community.” The Collaboratory contained multiple sections including statistics, causes, warning signs, effects, personal stories, photographs, and what you can do to help. This project was done in collaboration with CAAD, the Vassar Sculpture Department, Unframed, Vassar Greens, UNICEF, Red Sand Project, and Abolitionists Unchained. Soshyan Petroulus, a senior Media Studies major, used the trailer for her senior project on digital image based spam, taking the final form of a video essay projected in the Collaboratory, with physical artifacts and accompanying texts/materials.This project was timed to take place during the Media Studies senior project symposium held May 10-May 16. 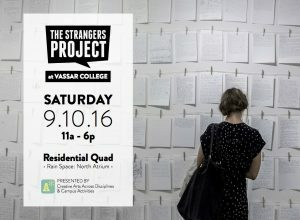 The Strangers Project is a collection of over 20,000 anonymous handwritten “journal entries” shared spontaneously by passing strangers. I ask people to write about anything they want—as long as it’s true. When people share their stories, we can explore the connections that make us human. Every day we visit work, school, cities, and businesses. We sit next to one another on trains, on buses and in cars. We take care of our families and friends, and of ourselves. Every day, we choose what we expose to one another. Beginning October 26th, For Freedoms, presented by unFramed, will take over the Collaboratory. They will flood it with art in the weeks leading up to the election. Wednesday starts with artist Michele Pred’s pro-choice project, #HerBodyHerVote.Thursday, we move on to For Freedoms’ “Freeedom Of/ Freedom For” project. Friday, VUE will be tabling for their accessibility campaigns. Vassar Urban Enrichment and VICE Special Events present an interactive hot chocolate experience. Pop into the Collaboratory this Friday to experiment with a variety of flavors and create a delicious concotion that will rendure your tastebuds senseless. ABUNDANT toppings will be provided! We promise. Let your creativity shape your unique hot chocolate experience. Did we mention it’s FREE?! Come build community, take a break from studying, and see what VUE has been brewing this semester. It’s a sweet treat! Audio Picnic is a campus news show run by a group of dedicated students who hold interviews, craft stories, edit, produce, and broadcast radio segments that are then played live on WVKR every Wednesday at 4pm. From the Collaboratory, the show will provide copies of the brand new WVKR zine and allow students to listen to cued past episodes. Most excitingly, students can be a part of an Audio Picnic episode by recording themselves responding to questions live with a professional quality microphone stationed in the Collaboratory. An audio-visual installation by Patrick Walker consisting of two musical compositions, Choral Fantasy, a meditative piece exploring the question of the insignificance of humanity in the greater universe, and M45 an electro-acoustic composition inspired by the Abenaki legend for the creation of the Pleiades constellation (Messier object 45), paired with simple projections. Step inside to learn some tap dance steps and watch dance videos. 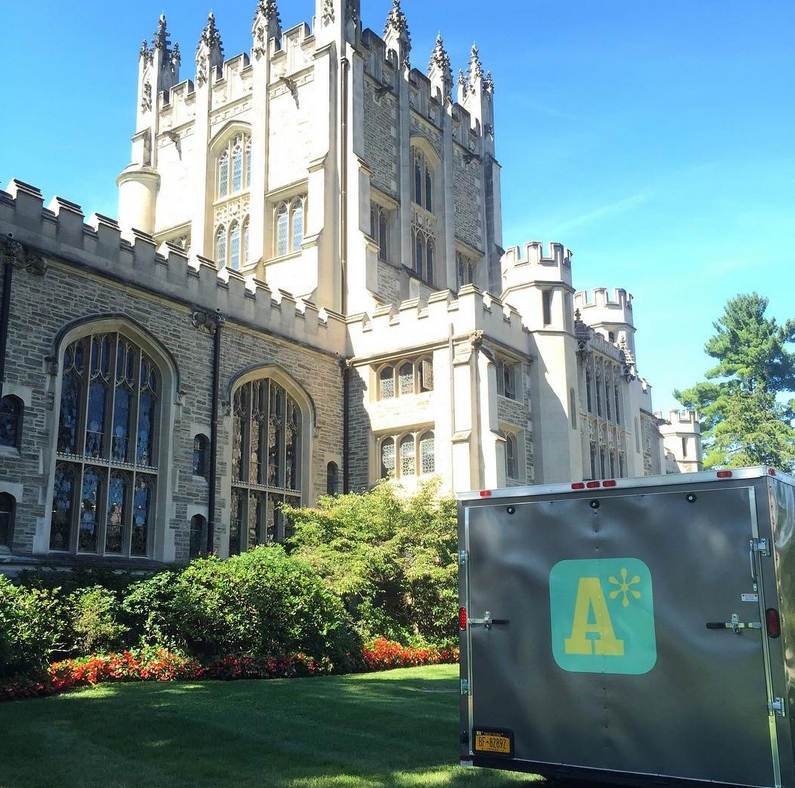 The student dance group Vassar On Tap is committed to promoting the art form of tap dance at Vassar. In the Collaboratory they will fuse dance with history to educate the Vassar community about the importance of tap dance as an American art form. The Vassar Greens, Student Class Issues Alliance, and the Creative Arts Across Disciplines Initiative collaborated to create a “textbook swap” at the beginning of the semester. The original goal was to combine these efforts with a concert featuring some of the college’s a cappella groups, but there was not sufficient time to organize part of the original vision. Kelsey Greenway (’16), Alex Raz (’16), Aran Savory (’16), and Joe DeGrand (’17) spent the summer interviewing Hudson Valley Hospice patients as part of the college’s multi-year Creative Arts Across Disciplines initiative project “Healing Narratives: De-Stigmatizing Trauma and Illness through the Senses.” It culminated in the creation of the devised piece, In Light Of, performed September 18-20 in the Susan Stein Shiva Theater. In the Collaboratory, audio and visual elements that did not make it into the performance setting, including notes, drafts, and interviews, were displayed as a space to reflect on the performance and to re-experience the voices and bodies that made it a reality. First inspired by the Day of the Dead celebration, éXodo is a journey of exploration of culture and identity written, composed, and moved to the personal narratives of Sofia Benitez (’18), Daniel Dones (‘16), Jacqueline Geoghegan (‘16) and Ariana Sacris­tan-Benjet (‘18), the project creators. During this summer, the group read books and manuscripts, studied history behind rele­vant traditions, composed music, wrote poems and journals and traveled to museums and cemeteries – collecting various items along the way that began to shape their artistic interpretations of death. Elements of this creative process were presented in the Collaboratory, including im­ages, recordings and writings. In addition, a line of clothes and textures that echoed the setup of their theater performance and an interactive feature delineated the space, allowing for participation and a transparent window into the project. Sixing Xu (’18), Yibo Yu (’18), and Shiqi Lin (’17) recorded sounds from the subway stations in Beijing and NYC, and along with visual hints such as subway maps, local newspapers and pop cul­ture item, presented them as an installation in the Collaboratory. Sounds that are too loud or too common to raise our attention, or sounds that hide themselves in headphones so we can hardly notice—were amplified and concentrated, and the seemingly dull everydayness of a sub­way ride came into life. Using the space as an immediate representation of a subway cabin, the group sought to encapsulate the var­ious sides of life in the two cities. Two classes, SOCI/ENST 368 Toxic Futures and ART 302-01, Painting II, got together around the single problem of toxicity in the environment this fall. In the painting class advanced studio art students explored a range of approaches to painting, while the Environmental Studies class, interested in public policy, explored environmental pollution and the future of the Anthropocene. The central questions Toxic Art addresses are: how does environmental theory approach the construction of the future, and how has this construction informed the present debates on the impact of industrialization, urbanization, state building and social movements on the environment? Through the voice of art, the exhibition sought to connect issues confronted within the academy with larger communities that deal with direct toxic threats in their everyday lives. Associate Professor of Sociology Eréndira Rue­da, the ALANA Center, and Hanna Jeong (‘17) presented the Our Voices project as part of the larger Children of Immigration Series – a collaborative series of events intended to bring together and foster a community of students, staff, and faculty who identify as immigrants or children of immigrants. Our Voices: Children of Immigration Narratives is an audio-visual media project that aims to share the complex, rich stories and lived experiences of these members of the Vassar community. Students were invited into the Collaboratory to be filmed or audio recorded as they shared narratives, poems, anecdotes, and/or reflections about their experiences as “children of immigration,” with the hope that these voices would complicate, challenge, and broaden the narratives and perspective that exist within the larger Vassar College community. Charlotte Foley (‘18), John Wallner (‘18), Camilla Pfeiffer (‘16), Anna Emy (‘18), and Amelia Rivoir (‘18), as part of their EDUC 263 media project, presented A Body of Water: Reconciling Body Image in Adolescence. The project aimed to process personal experiences with body image in adolescence through multimedia metaphor. The group composed an experiential multi-sensory collage to evoke a common understanding of body in our minds, homes, classrooms, communities and the media. The space they built together in the Collaboratory was interactive for all visitors, stimulating and engaging participants across the senses. They included the lived experiences of others by recording the voices of their peers narrating their own experiences with body image and used these interviews as a soundtrack for the space. Choreographed by Ryan Eykholt (’17), (beat) is a dance piece existing across segmented time and space and a culminating project for the Creative Arts Across Disciplines sponsored class The Arts of Silence. With live performance by Xiangyi Tan (’17) and Saskia Globig (’19), recorded video projections, and photo stills, this piece explored how the body is performed, preserved, and perceived. The Philaletheis Society will host a staged reading of the play “Map of Virtue,” marking the first event in the Collaboratory. Curated and moderated by Kevin Ritter, “Dis/Locating Home/Towns” is a performance series, community dialogue, and temporary library engaging with the hometown, dislocation, and the globalizing world. This project is cosponsored by the English and Drama Departments, the Urban Studies Program, and the student organizations Philaletheis, Unbound, and Britomartis. “Exotic” is a portrait series by Vassar student Imrul Islam focused on fellow students’ experiences of ethnocentrism. The exhibition features both visual and textual elements as well as space for visitors to leave feedback and engage with the work. 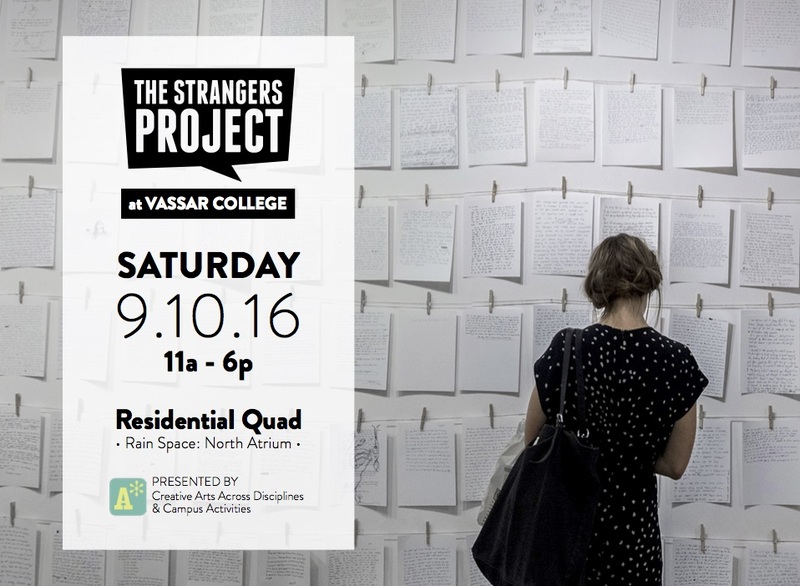 The Vassar College Photography Collaborative is inspired by the Lens Blog, the New York Times’ photojournalism blog. Their blog has many different photo-stories including “Pictures of the Day.” This section displays photographs of events occurring all around the world.”The Lens Blog: February” is a visual index of daily life at Vassar during the month of February. All photos included in this exhibit were taken by students. “Embodying Compassion” is the theme of the new issue of the Office of Religious and Spiritual Life zine, created by Vassar members of the Vassar community. This event precedes the RSL Day of the same theme, an inter-religious celebration in conjunction with the “Embodying Compassion in Buddhist Art” exhibit at the Frances Lehman Loeb Art Center. This installation by Toscane Clarey ’17 features displays of poems and sound to create a sensory experience. The Vassar Libraries are hosting Zines Week in the Collaboratory. There will be materials available for anyone to contribute to zine-making, so drop in and create something. Contact zines@vassar.edu for more information. This sound and technology installation by Sam Plotkin ’15 uses computer algorithms to produce music. This new, short comedy was devised by Elizabeth Snyderman, Frank Hoffman, Mark Lawson, and Caleb Featherstone, and created by Collin Knopp-Schwyn.